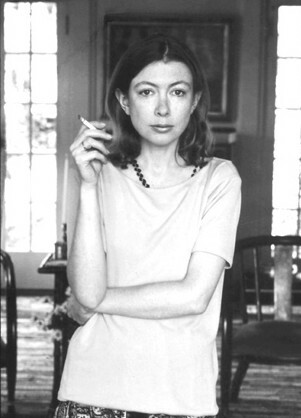 Joan Didion published her first novel, Run, River, at age 29. But I think we should disregard this fact, for two reasons: 1) She has since raised concerns about the novel, and 2) Soon after publishing, she describes being “paralyzed by the conviction that writing was an irrelevant act, that the world as I had understood it no longer existed. 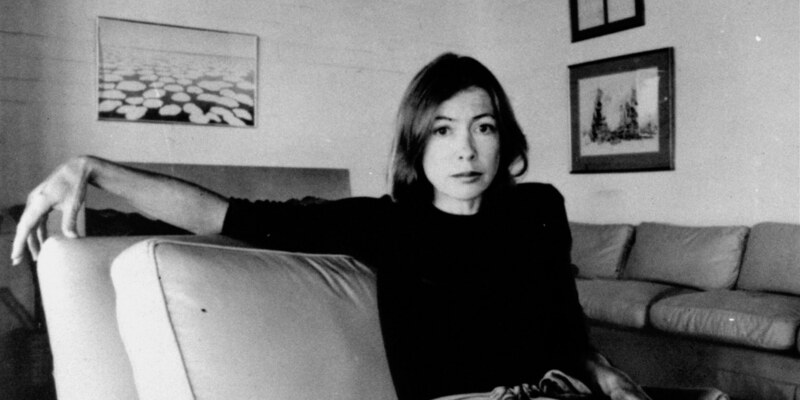 If I was to work again at all, it would be necessary for me to come to terms with disorder” (Slouching Towards Bethlehem, xi-xii), a feeling that culminated in the publishing of her first nonfiction work, and one of her most famous–Slouching Towards Bethlehem–at age 34. Since then, she has written 8 works of non-fiction, 5 screenplays, 4 works of fiction, and 1 play. “In Berkeley in 1975 I had unpacked my clothes and papers in a single room at the Faculty Club, walked once across campus, and regressed, immediately and helplessly, into the ghetto life of the student I had been twenty years before. I hoarded nuts and bits of chocolate in my desk drawer. I ate tacos for dinner (combination plates, con arroz y frijoles), wrapped myself in my bedspread and read until two A.M., smoked too many cigarettes and regretted, like a student, only their cost…I fell not only into the habits but into the moods of the student day. Every morning I was hopeful, determined, energized by the campanile bells and by the smell of eucalyptus and by the day’s projected accomplishments. On the way to breakfast I would walk briskly, breathe deeply, review my ‘plans’ for the day: I would write five pages, return all calls, lunch on raisins and answer ten letters. I would at last read E.H. Gombrich. I would once and for all get the meaning of the word ‘structuralist.’ And yet every afternoon by four o’clock, the hour when I met my single class, I was once again dulled, glazed, sunk in an excess of carbohydrates and in my own mediocrity, in my failure–still, after twenty years!–to ‘live up to’ the day’s possibilities” (Pacific Distances, in After Henry, pg.115-116). “I am talking here about a time when I began to doubt the premise of all the stories I had ever told myself, a common condition but one I found troubling. I suppose this period began around 1966 and continued until 1971. During those five years I appeared, on the face of it, a competent enough member of some community or another, a signer of contracts and Air Travel cards, a citizen: I wrote a couple of times a month for one magazine or another, published two books, worked on several motion pictures; participated in the paranoia of the time, in the raising of a small child, and in the entertainment of large numbers of people passing through my house; made gingham curtains for spare bedrooms, remembered to ask agents if any reduction of points would be pari passu with the financing studio, put lentils to soak on Saturday night for lentil soup on Sunday…This was an adequate enough performance, as improvisations go. The only problem was that my entire education, everything I had ever been told or had told myself, insisted that the production was never meant to be improvised: I was supposed to have a script, and had mislaid it” (pg. 11-12). Also, as demonstrated by Céline’s recent ad campaign, she is an 80-year-old who can rock a pair of sunglasses. 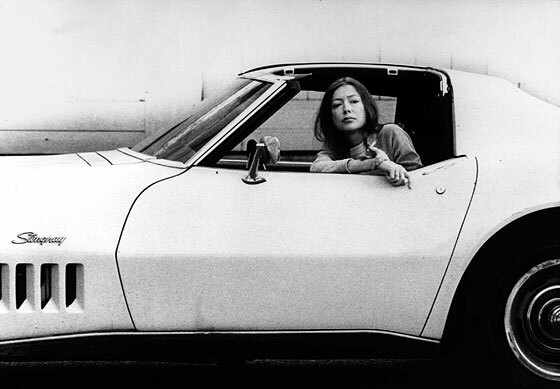 Thank you for your thoughts, Joan Didion! To read about more women making critical contributions – even after age 30 – Follow me on twitter @shespoised or like She’s Poised on Facebook (and select Get Notifications from the drop down menu).